The Arapahoe Ridge area will see big changes to the familiar Eastpoint complex at Arapahoe and Eisenhower in the near future. The buildings in the complex are about 43 years old—too outdated to refurbish. Developers plan to completely replace the complex with innovative buildings, underground parking, and more open green space. Construction should be finished by spring 2019. 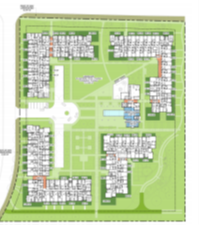 The Eastpoint plan calls for a high density, multi-family residential complex of middle income housing. There will be 5 buildings instead of the current 8. The new 3-story buildings will increase total apartments from 140 to 226. More affordable housing is a benefit to Boulder because it will allow more families to live in Arapahoe Ridge. This is an area of Boulder where job opportunities are expanding. The innovative, modern buildings all have flat roofs. About three-quarters of the roof surface will be covered with plants. The remaining quarter could be used for solar energy in the future. Residents will enjoy a fitness center with a climbing wall, an indoor/outdoor pool, yoga room, and lounges. Add to that a dog park, and a network of bike- and pedestrian-friendly multi-use pathways. Once rebuilt, Eastpoint will have about 30 percent more open space. This means about 6 acres on the 7-acre site will be open with no buildings. Much of the gain in open space is because of the underground parking. 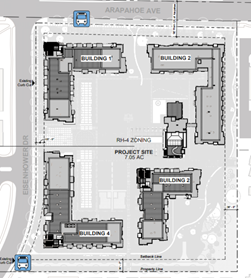 All parking is under the buildings, except for 7 visitor spaces, which will greatly reduce the amount of paved areas. The underground garage has a large area for storing bikes. The top of the garage will be planted with a Zen Garden. Underground parking is certainly more attractive, since it reduces paving and hides cars. However, the downside is that it allows has more parking spaces onsite. That will mean more cars and people on the road at Arapahoe and Eisenhower, especially during peak traffic times. Modernization and a green plan for the Arapahoe Ridge Eastpoint Apartments will bring more affordable housing to the area. But that also means more people and cars on the move in a sensitive area. The next article talks a bit more about traffic management and transportation choices for this development. A project that mixes living, shopping, and working could be built on the 5800 block of Arapahoe Avenue. Zocalo Community Development will work with Coburn Architecture and other local firms to build Waterview. The new site will have 10 three-story buildings on the 14.86-acre site. A potential issue is that there will only be one point for entering and exiting from Arapahoe Avenue. The question is if the new traffic will cause problems during rush hours. The picture shows where the enter/exit point will be on Arapahoe. 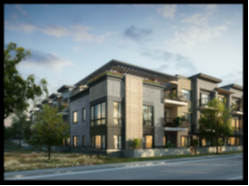 The living aspect at Waterview will have 60 studio apartments, 236 one-bedroom apartments, 32 two-bedroom apartments, and 12 two-bedroom townhomes. About 40% of the apartments will be affordable housing. The rest of the new buildings will be for offices and retail stores. 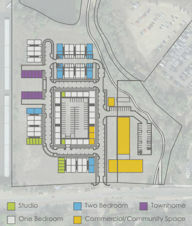 Take a look at the picture to see where the residential, retail, and office spaces will be. Zocalo wants to build a new neighborhood that will be friendly for bikers and walkers. 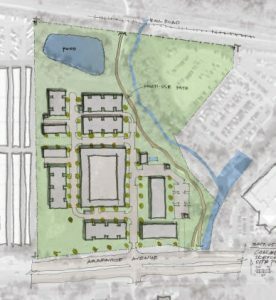 The proposed site already has an open space, a creek, and a pond. Zocalo is planning to put in a path for walkers and bikers, and a golf course. They want to make Waterview an appealing eastern entrance into Boulder. A central parking building will hold 215 parking spaces. The housing units will be built around the parking building so that it is hidden. There will be another 180 parking spaces outside the parking building in the retail and office areas. Those spaces will be mostly inside or underneath various buildings. All those parking spaces means cars will show up to fill them. And that means more traffic on Arapahoe. The next article talks about how the new project might affect traffic. This project is in review at the City of Boulder Planning and Development Services. Voice your support and/or concerns at the PLANNING BOARD PUBLIC HEARING Thursday, August 17, 2017 at 6 p.m. in City Council Chambers Municipal Building, 1777 Broadway (corner of Broadway & Canyon).